Gear motors are complete motive force systems consisting of an electric motor and a reduction gear train integrated into one easy-to-mount and -configure package. This greatly reduces the complexity and cost of designing and constructing power tools, machines and appliances calling for high torque at relatively low shaft speed or RPM. Gear motors allow the use of economical low-horsepower motors to provide great motive force at low speed such as in lifts, winches, medical tables, jacks and robotics. They can be large enough to lift a building or small enough to drive a tiny clock. Most synchronous AC electric motors have output ranges of from 1,200 to 3,600 revolutions per minute. They also have both normal speed and stall-speed torque specifications. The reduction gear trains used in gear motors are designed to reduce the output speed while increasing the torque. The increase in torque is inversely proportional to the reduction in speed. Reduction gearing allows small electric motors to move large driven loads, although more slowly than larger electric motors. Reduction gears consist of a small gear driving a larger gear. There may be several sets of these reduction gear sets in a reduction gear box. Sometimes the goal of using a gear motor is to reduce the rotating shaft speed of a motor in the device being driven, such as in a small electric clock where the tiny synchronous motor may be spinning at 1,200 rpm but is reduced to one rpm to drive the second hand, and further reduced in the clock mechanism to drive the minute and hour hands. Here the amount of driving force is irrelevant as long as it is sufficient to overcome the frictional effects of the clock mechanism. Another goal achievable with a gear motor is to use a small motor to generate a very large force albeit at a low speed. These applications include the lifting mechanisms on hospital beds, power recliners, and heavy machine lifts where the great force at low speed is the goal. 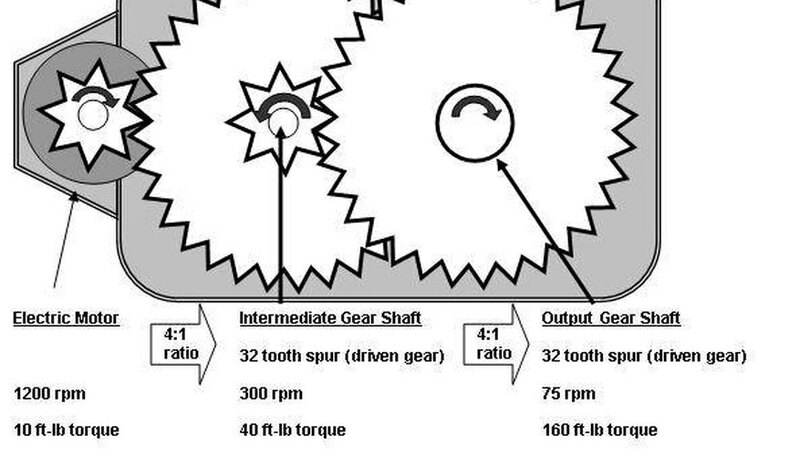 Most industrial gear motors are AC-powered, fixed-speed devices, although there are fixed-gear-ratio, variable-speed motors that provide a greater degree of control. DC gear motors are used primarily in automotive applications such as power winches on trucks, windshield wiper motors and power seat or power window motors. What power can openers, garage door openers, stair lifts, rotisserie motors, timer cycle knobs on washing machines, power drills, cake mixers and electromechanical clocks have in common is that they all use various integrations of gear motors to derive a large force from a relatively small electric motor at a manageable speed. In industry, gear motor applications in jacks, cranes, lifts, clamping, robotics, conveyance and mixing are too numerous to count.